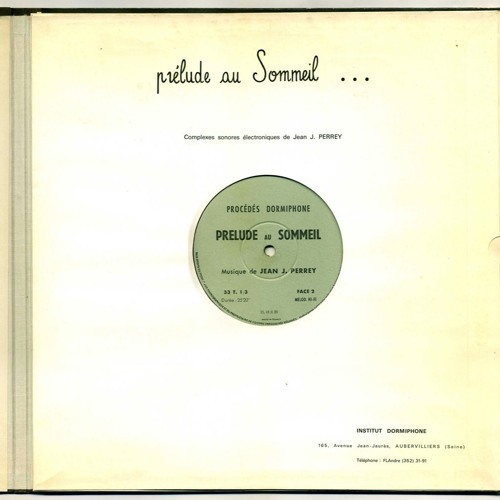 Classic Jean-Jacques Perrey - Prélude au Sommeil, mono LP published by Institut Dormiphone, France, 1957 and soon to be re-issued as a sunburst picture disc on Moochin' About.... Jean-Jacques Perrey's first solo LP, Prélude au Sommeil, or Prelude to Sleep, consisted of 2 side-long tracks of ambient electronic music played on George Jenny's Ondioline. The disc is actually a private release from a so-called Institut Dormiphone (also Procédés Dormiphone), aka Perrey himself, in an edition of 500 copies, according to official biographer Dana Countryman. The music is intended as sleep-inducing and tranquilizing for use in mental hospitals... Have you taken your medication today...?